GENERAL: Aussie Pump’s general terms of sale represent a statement of contracts to supply equipment between Australian Pump Industries Pty Ltd and its customers. Prices printed in the Aussie Pumps price list are current at date of issue and are subject to change without notice. Prices charged will be those ruling at the date of delivery. All retail prices quoted are recommendations only. There is no obligation to comply with these recommendations. The validity of any quote given by Aussie Pumps will be 30 calendar days unless stated otherwise in the quotation. We reserve the right to withdraw quotations in writing before the end of the validity period. Pump sets, pressure cleaners or sprayers, or any other product, not listed as a standard product in the price list may be manufactured by Aussie Pumps against specific customer order and specification. These units are not eligible for return under the stock swap program. It is the purchaser’s responsibility to satisfy itself of the suitability of any special order products being built by Aussie Pumps for the buyer’s purpose based on the information provided by Aussie Pumps in its quotation. Special orders as described above are not subject to cancellation or deferment and are to be considered as absolutely firm orders. Warranties applicable to special order products as described above are the same as that which applies to all standard Aussie Pumps product, other than for those items supplied to Aussie Pumps by third parties for which Aussie Pumps will assign the original supplier’s guarantee to the buyer of the “special order product”. Freight prepaid in unused condition and in original packaging. Obsolete products are not eligible for return. Products returned for credit must be unsoiled, undamaged, in resaleable condition and not more than 12 months old. All returned products must be accompanied by a copy of the original delivery docket. A written statement including the original invoice number, the date of purchase and full reasons for the return. Credit value of the goods returned will be at the absolute discretion of Aussie Pumps and will be limited to the original amount invoiced for that product. Please note that a restocking charge, the amount of which shall be at the absolute discretion of Aussie Pumps but will be not less than 15% of the original price of the product, will be applied to cover restock, repackaging, documentation and administration charges. Return approval will not be granted without a signed statement from the customer agreeing to the restocking fee. Aussie Pumps must be notified, in writing, within three (3) working days of delivery of any goods incorrectly supplied so that prompt replacement with the correct products can be arranged. All deliveries should be inspected for missing or damaged goods before the buyer signs for the goods. Missing or damaged goods should be noted on the consignment note. Any claims for missing goods or for products supplied in damaged condition must be reported to Aussie Pumps, in writing, within three (3) working days for the claim to be considered. N.B. Our terms are ex works. Claims for damage in transit will not be considered. 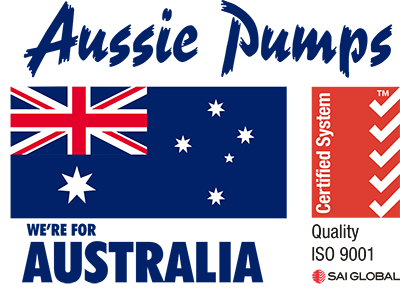 All Aussie Pumps products are guaranteed to be free from faulty workmanship or material as detailed in the warranty card supplied with each product and as detailed in the operators manual that is supplied with the goods. All engine warranty claims should be made directly to the service agent for the engine manufacturer and warranty is subject to their terms & conditions. All battery warranty is covered by Federal Batteries, 39 Church Street, Parramatta, (02) 9879 5422. Call to find their nearest nominated agent. Repairs carried out by Aussie Pumps Service Division on products outside the guarantee period are guaranteed to be free of faulty workmanship or material for a period of three (3) months after the repair. Warranty is deemed to apply to failures due to faulty workmanship or materials and does not apply to fair wear and tear, improper installation or application, the users failure to carry out maintenance, or as a result of the product’s use for purposes for which it was not designed. Aussie Pumps is not liable for any loss of profit or consequential or indirect special loss arising from defects in any of its products. Aussie Pumps will not be liable for damage or injury of any kind whatsoever arising directly or indirectly from product defects. payment of the cost of having services supplied again. Aussie Pumps reserves the right to choose the lowest cost option of the above. The benefits under the Aussie Pump warranty are in addition to other rights under Australian Consumer Law. N.B. All prices are ex works Castle Hill warehouse. If purchaser chooses to use our carrier insurance is purchaser’s responsibility. DEMONSTRATION/FIELD DAY STOCK – In the event that goods are loaned to a customer for demonstration or display, the customer is responsible for return of the goods in A1 BRAND NEW CONDITION. Any parts, labour or packaging required to put the loaned items back into brand new condition will be charged to the customer at normal rates. N.B. The customer is deemed to be the person / customer to which Australian Pump Industries loans the goods.